I was recently sent some MagnaPods to review. What on earth are MagnaPods you ask? 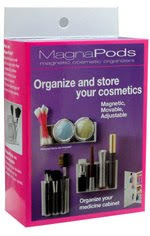 MagnaPods are these nifty little home organizers. I was sent the MagnaPods Cosmetic Organizer (#0106) with adjustable dividers and the MagnaPods Toothbrush holder (#0201). I was really excited to get the cosmetic organizer especially because as you might have guessed by now, I have tons of makeup (and I am constantly buying more). 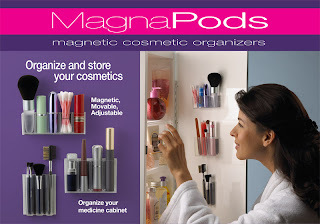 When my MagnaPods arrived I was a little upset to realize that I do not have a magnetic medicine cabinet in my bathroom! Our apartment is older and has a wooden medicine cabinet. What to do? Then I realized that while MagnaPods are marketed for bathrooms...they are great everywhere! I took my MagnaPods to work (the cosmetic and the toothbrush holder) and used them to hold the make up and toothbrush and toothpaste that I had previously thrown into the back of the locker. Now I don't have to search for the stuff I use the most. It is now easily accessible. Yay! I meant to take pictures for this review, but I keep forgetting to take my camera to work. Trust me, these MagnaPods worked out great. I have lipstick, eyeshadow (of course! ), chapstick, a little bottle of lotion, mascara, toothpaste and more in my MagnaPods. I do wish that they were a little deeper so that they would accommodate more of my eyeshadow, but I still love them! The toothbrush holder worked great for my work toothbrush (hey..I work 13 hours on some days, I need my toothbrush!). However, It would have been too small for my bigger toothbrush at home. Disclaimer: I received the above products as compensation for this review. There was no other compensation and the opinions state are my own honest thoughts.